All Slots And All Jackpots Announce The Launch Of 4 New Slot Games In March That Are Sure To Heat Up The Action Plus 2 Exciting Promotions. 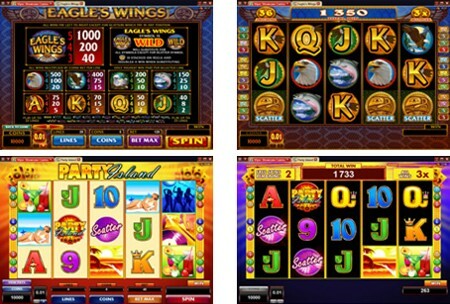 Players at All Slots and All Jackpots online casinos will be flying high on this 5-reel, 25-payline slot machine game. Stacked Wild symbols will double your payouts and offer extra opportunities to win big. If three or more scatters appear on the reels, up to 60 free spins with tripled payouts will be activated. Free spins can be retriggered for even bigger winnings! The new games add variety and excitement to the slot games lineup and offer action-packed modern slots with stacked wild symbols and popular free spin bonus features. Soar through skies with up to 60 free spins on this majestic 25-payline slot game Eagle's Wings. With a keen eye, you'll spot the prized stacked wild symbol and catch some extra coins in winnings! It's time for some fun in the sun at a party that never ends! Kick up your heels on this 9-payline slot game with a generous wild symbol, a hot gamble feature, and free spins that award tripled payoffs. You can party until the break of dawn! The heat is on! Re-spin your way to some sizzling winnings on this 30-payline video slot. The flaming free spin bonus round could win you up to 20 free spins with doubled payouts. Get up to 440,000 coins per spin when the red-hot wild symbols line up in your favour! Congratulations to the All Slots casino player Linda V who has won $13,875.00 playing Retro Reels - Extreme Heat slot on 10th of March. Travel to the Far East and discover unmatched beauty and grace in this online slot game that pays out 243 different ways! If good fortune smiles on you, the Treasure Chest symbols will trigger up to 25 free spins with doubled payouts. Reveal three of the same princess in the bonus feature game and win up to a 30x multiplier! March Promo: The Carnival Bonus Bash! To celebrate the Carnival season which has streets around the world bursting with color, energy and excitement, All Slots and All Jackpots online casinos are hosting an exciting bonus giveaway running through April 5th. Each week, $10,000 in prizes will be given away, and over 100 lucky winners will be drawn to win. To qualify, participants must simply play $75 or more at the casino during each weekly promotion period. It's back! The Grand Slam of Slots is returning to All Slots and All Jackpots casinos, this time featuring a grand prize of $2.43 million in gold. Hundreds of thousands in cash prizes will also be awarded to the top players in the tournament set to take place this May 27th-June 6th, and the select casinos will start hosting qualifier tournaments this month with free qualifier tournaments, buy-in network qualifier tournaments, and free ticket giveaways to lucky players. Join All Slots or All Jackpots casinos to play the newest games and take part in the exciting promotions this March.